An very old house, recently refurbished with love and works of art. Independant house for 8 people with pool, 300m from the village. It is located in the middle of an open space, whith olive trees and vineyards of Domaine. 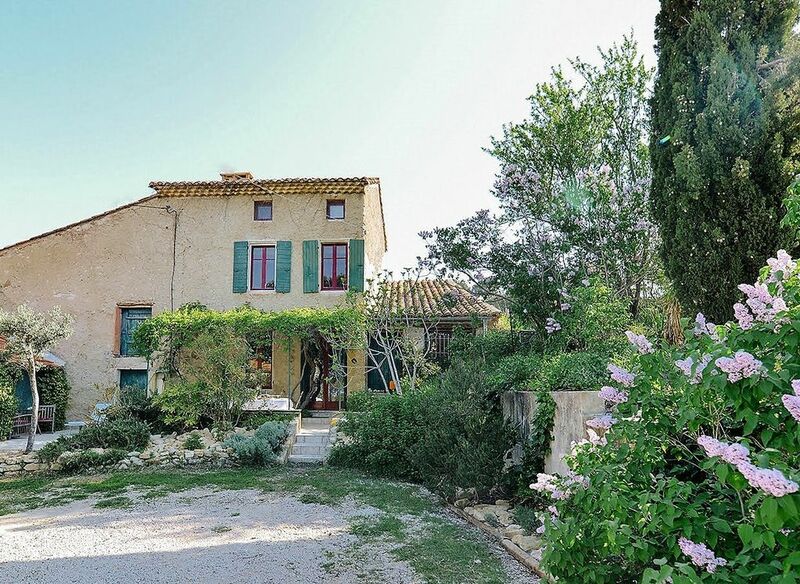 Le Mas des Bergines is an old house, completely refurbished, on 3 levels. The ground floor comprises: fully equiped kitchen, living room, TV room with high speed internet, a bathroom with shower and WC, leading onto a secluded mezzanine ideal for an adolescent. The terrace is shaded and has a large tiled table for large family meals, adjacent is an other area with loungers and roses. The second level comprises : the master bedroom, an adjacent single, as well as a bath and separate shower room. The wc is independant. The third level comprises a very large room with two to three single beds as well as a master bedroom with an ensuite shower and wc. It is perfect for two couples with children or a family with grand-parents. Prices are all inclusive (linen, beach towels, wifi, end of holiday cleaning). The Clos de Caveau also runs wine tasting events as well as organized walks through the vineyard's nature trail. A very large group or family could also rent the neaby Villa des Bergines to house for 12 to 14 people. A few miles from the roman sites of Orange and Vaison La Romaine, the area offers many site seeing outings as well as various hikes in the famous 'Dentelles de Montmirail' mountains (1h30 walk from the house very top of the Dentelles). I became a winemaker leaving behind my life as a London psycholigist and psycho-analyst more than twenty years ago. Why? I find it extraordinary that beautiful wine comes out of the ground. My favorite outing: walk the Dentelles de Montmirail, in summer at sunset. Couldn't live without? : Love! Favorite dish :My grand-mother was from the Drome and from Nice, she loved Bouillabaisse and so do I ! A memorable wine tasting? The vine plots around the Clos made, for generations one wine.. and after a lot of research I discovered that the terroirs were different. I was gobsmacked tasting the cuvée from the newly identified terroir: Fruit Sauvage, Carmin Brillant, and Lao Muse. I've opened the vines to the public for every one to discover this beautiful part of the world. My father purchased the Clos in 1976, from Steven Spurrier, now famous editor of Decanter magazine. Previously my father was parfumer in New York (Houbigant) and publisher in Paris (Le Livre de Paris). When I lived in Paris, and later in London I would visit the Clos for wonderful busy family holidays. Later my children and wife took a liking to the vineyard and we moved here. The house is not only within walking distance of Vacqueyras village (restaurants, bakery, pharmacy etc.) but also situated on the foot hills of the protected park of the Dentelles de Montmirail mountains. Hikers and mountain bikers therefor have direct access to the wilderness. Road bikers can also do the nearby famous Mont Ventoux. The swimming pool is isolated and surrounded by vines and olive trees. The terrace has two areas: one for eating and one with loungers and chairs. There were four of us on this trip. We each felt a sense of relaxation and calm. We spent meals outside on the terrace and we spent the days chatting by the pool. The location is great, nestled amongst vines, secluded enough to feel the serenity, close enough to Vacqueyras (and all other towns) for easy jaunts to pick up provisions. Henri joined us for a chat one afternoon and it was lovely. I look forward to renting again. It was nice meeting you. I hope the return home Canada was not too cold.. Hope to see you next year. Beautiful location, very clean, and well equipped. Well-proportioned rooms nicely furnished, and the ground floor is wonderfully cool in hot weather. You can walk to get your croissants from the village (two perfectly good places to eat there) but have perfect peace and privacy. And vines all around. We came with my wife and our three children as well as my parents. We all had a lovely time... sometimes we would go on long excursions and the kids would enjoy the pool (nearby) and their grand-parents. It worked out realy well. The house has lovely artwork and a separate TV/playroom for the kids. We were well seen too by Henri and his staff. Last but not least his wines are among the best in the area. We are pleased he has asked us to write an appreciation. Piscine ouvert pour nous seulement le temps pas tous les jours tres chaud. Quelque petits problemes dans la maison, toute suite regulé par les proprietaires. Ideal pour visiter ville culturelles et interessant dans le region, prete de Orange, Carpentras et Vaison la Romaine (et autre villes). Et du vin joli (cru Rhône) partout!! Restaurants tres bons a coté, etoile a Gigondas mais aussi bonne cuisine locale dans la ville. Boulanger (bien) a 5 minutes a pied, supermarche pas loin. On a bien adoré la maison et la region. Merci Henri et Jean-François aussi pour le vin!! A Vacqueyras, take the road of Montmirail fire near the pharmacy. Reached a bend (500m), cross the bridge and take the first road to the left. You have arrived.